Positive Letters .... inspirational stories ....: Kissing under the Mistletoe - how did it all begin? and Asterix! Kissing under the Mistletoe - how did it all begin? and Asterix! One plucked berry at a time .. and when the last berry has gone, there should be no more kissing under the mistletoe. This became an English Christmas-time custom dating back to at least the early 17th century (1600s). The correct procedure!, now seldom observed, is that a man should pluck a berry when he kisses a girl under the mistletoe, and when the last berry is gone there should be no more kissing... sad to say! 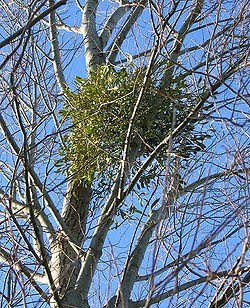 Shakespeare mentions mistletoe in Titus Andronicus Act II in an unflattering reference “Overcome with moss and baleful mistletoe”, though why mistletoe should be so described is open to conjecture .. perhaps it was because the white berries form in winter, or it hangs in a tree open to the elements on bare branches at the time of the winter solstice. Mistletoe is a parasitic plant that grows attached to and within the branches of a tree or shrub. The word ‘mistletoe’ possibly comes from the old German Mist for dung and Tang for branch, since mistletoe can be spread in the faeces of birds moving from tree to tree, which can happen within 4 to 25 minutes. However the Old English word ‘mistel’ was also used for basil. Mistletoe had figured prominently in Greek and Roman mythology, while in Scandinavia the Norse God Baldr was killed with mistletoe. In England and Europe the mistletoe favours apple trees, while the Druids held it in great veneration when found in oak trees; but as a parasitic plant, which mainly uses the host for water and mineral nutrients, it can be found in more than 200 trees and shrub species. Most mistletoe seeds are coated with a sticky material which are then spread by birds, such as the Mistle Thrush in Europe, the Silky Flycatcher in south western North America or the Mistletoebird in Australia amongst others. European mistletoe has waxy white berries in dense clusters of two to six; in America the Eastern mistletoe is similar but has longer clusters of 10 or more berries – and it is this variety in the States that is harvested for Christmas. There’s a red berried mistletoe in New Zealand, which is a threatened species, while Australia has the grey mistletoe, which is beloved by the mistletoe bird. South Africa too has its mistletoes. Megan of It’s All About Joy! Suggested that in the States mistletoe for Christmas would be shot down, that may well be so as mistletoe would be found out in the woods when the men were hunting. Here, in the UK, our gun laws are distinctly stricter – though I could imagine years ago that the hunters might have gathered it that way – or if they are of Robin Hood ilk would have used a bow and arrow. Mistletoe is commonly used as a Christmas decoration, though such use was rarely alluded to until the 18th century, though it was not used in Church. According to custom, the mistletoe must not touch the ground between its cutting and its removal as the last of Christmas greens at Candlemas (2nd February); however in the old days it may have been left hanging through the year, often to preserve the house from lightning or fire, until it was replaced the following Christmas Eve. The tradition has spread throughout the English-speaking world but is largely unknown in the rest of Europe. Mistletoe was often considered a pest that kills trees and devalues natural habitats, but was recently recognized as an ecological keystone species, an organism that has a disproportionately pervasive influence over its community. A broad array of animals depend on mistletoe for food, consuming the leaves and young shoots, transferring pollen between plants, and dispersing the sticky seeds. The sticky seed of the mistletoe stuck to a branch after it dropped. The dense evergreen witches' brooms formed by the dwarf mistletoes of western North America also make excellent locations for roosting and nesting of the Northern Spotted Owls and the Marbled Murrelets. 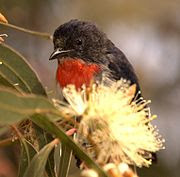 In Australia the Diamond Firetails and Painted Honeyeaters are recorded as nesting in different mistletoes. This behavior is probably far more widespread than currently recognized; more than 240 species of birds that nest in foliage in Australia have been recorded nesting in mistletoe. If you like Asterix as a great many do (& I couldn’t resist this reference to mistletoe) - Getafix, the druid in the Asterix comics, was often seen up trees collecting mistletoe for his magic potion. To fight Vitalstatistix, chief of Asterix’s tribe, the Romans enlist a Gallo-Roman Chief, Cassius Ceramix of Linoleum. Vitalstatistix would surely win with Getafix’ magic potion of invincibility, but the Romans plan to dispose of the druid long beforehand. 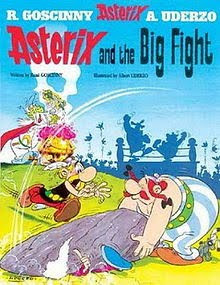 In an effort to rescue him, Obelix accidentally puts Getafix out of action with a menhir (large stone), the impact of which causes amnesia and insanity. I love those names! - who said Latin was dead? According to a listing I found in Lesley Gordon’s “Green Magic”: Flowers with the Sentiments which they Represent” – Mistletoe’s sentiment = ‘I surmount all difficulties’. While she also let us know that the official floral emblem of Oklahoma is the American mistletoe. If mistletoe will help us “surmount all difficulties at this time of year” – it is probably a good piece of greenery to have around, with or without its berries (once kissed up) and as it will preserve the house until next year. 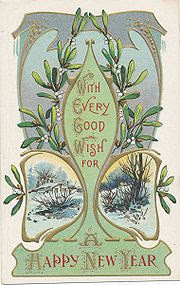 Dear Mr Postman I send you and our readers a mistletoe Christmas card circa 1900! We're well and my mother is enjoying her Christmas cards with news from family and friends, from far and wide. Oh Hilary, now we are friends forever. I love Asterix but actually never really thought about what the druid was gathering. Yes, those names and books are priceless. Hi Wilma - so pleased that's made 'our' day! In the 1960s Asterix gave us a historical version of life - luckily endorsing the fact that the Romans gathered mistletoe ..
A merry, blessed, wonderful Christmas to you... filled with love. And kisses and hugs to your Mum. Hi Daphne .. nor did I - enjoy your dating, dance away til dawn .. and kiss under the mistletoe - enjoy yourself! You too - have fun and enjoy life, and many thanks for the warm thoughts and hugs - Mum is enjoying herself I'm pleased to say. I had no idea that mistletoe was such an intrusive plant. I have to say that it was next to impossible to find fake or real mistletoe in these parts. Craft supply stores, for the most part, didn't carry it, and the garden centers I called didn't have any, either. I thought everyone loved mistletoe! But from what I've read here it seems that perhaps mistletoe has gotten a bad rap in some ways. If not for its tradition, then certainly for its invasive plant nature. What a hoot, though, to learn so much about it. 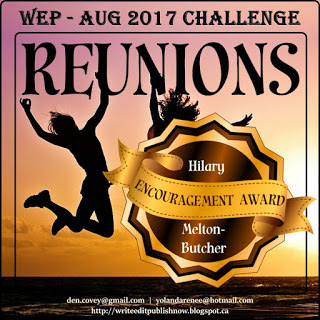 Once again I thank you, Hilary! But glad you've learnt a bit coming over .. just sorry you can't find it where you are - perhaps it'll come in next week - there's still a week to go? Perhaps the big guns are going out this weekend??!! Thank you for all this information. My mum had a "fake" mistletoe ball that she always hung up in Christmas time by the guest door. Now I understand the importance of it for her. I thought it was because my parents were so reserved it gave them permission for public affection for about 2 weeks a year! Thank you for this good review - always good to learn something new. Hi Patricia .. they've been talking about a mistletoe ball .. fake or not - I'm not sure - but I guess you'd get more berries!! You were probably right - it was possibly your mother's way of saying .. I enjoy the touching, hugging thing that we women like and appreciate. Thanks for the comment - yes Mum seems to be 'enjoying' the season .. she loves her cards and letters .. I only ever read Asterix in French and never understood a word of it as a kid. And what was up with all the battle scenes in those books?? Yay for birds nesting in mistletoe!! I loves me some spotted owls, even tho I've never even actually spotted any. I like the idea of them all having fun in their little mistletoe hideouts. Love mistletoe and the stories you share. I saw three deer out amidst the snow recently nibbling on hollyberries. They inspire us to rub noses together, kiss like eskimos, regardless of how cold it seems outside. Happy Holidays! Hi Jannie .. they caught the attention through the very wonderfully drawn cartoon depictions. The series follows the exploits of a village of ancient Gauls (Belgian and French) as they resist the Roman occupation - magical potions come into force. Asterix as the leader and his friend Obelix have various adventures at their village home, and abroad. Just a wonderful way to get a grasp of aspects of history, and realise how we got here today; while giving us an idea of the Latin language .. Latin that first comprehensive European language, many words are still in use today, and the roots of those words abound. Yes .. keep spotting - owls are notoriously difficult to spot! I went and 'camped' out for an hour one evening to see a barn owl hunting from an oak tree with my god-daughter and her family .. just sitting quietly watching and listening to the night sounds was special. Perhaps your high-heeled runners disturb them and they wait for you to tap tap past? Mistletoe is proving itself a worthwhile plant to be protected with the various habitats that can survive or spread from it ..
Hi Liara ..Thank you .. are you in Estonia, or Newfoundland .. obviously a cold climate! Love that picture of deer rubbing noses, kissing like eskimos, warming our hearts even in this cold snap we seem to be having. Thank you for the festive thoughts - you too wherever you might be. Just glad you liked the mistletoe stories - I learnt so much. What a lot of information we learn from your posts. 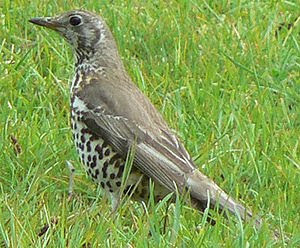 It feeds a lot of birds when there is not much for them to feed on and nest in this time of year when it is cold. The other leaves are gone. This gives them protection and food. Have a great weekend. Have a very joy filled holiday season. Hi Dan and Deanna .. many thanks and I'm so pleased you're happy to learn some new things. We tend to think of things singularly .. without remembering the whole that's created - everything on earth has a purpose - some we still have to find out about. You too - enjoy the family and friends - be happy ..
My reply was wiped when the spycatcher moved me to another place. Hopefully this time I'll have better luck. I had no idea that mistletoe was consumed by so many birds and animals. I had always assumed it was poisonous. By the way Hilary, I can't find the post where you left me your email address. Mine is: lawson.cath7 at gmail dot com. Hi Cath .. thanks for doing it again. I know it really is such a pain, when you lose a comment. It is poisonous to us .. but that's often the case, some birds can eat things we, as humans, can't. Mistletoe is obviously an important food source. Thanks Cath - I've emailed you ..
Hope all goes well at this time - I'll be thinking of you and the family ..
Hi Hilary, thank you for your thoughtful comments in my blog. Pardon me, I have been here in your blog a few time but I have never left any comment; not that I did not want to but I had nothing valuable to add to your post. I hope that you and your family will have a wonderful Christmas and a Happy New Year in advance. Hi BK - thank you for these words. I just wanted to acknowledge that I appreciated you following my blog - and it's always nice to know it's being read! So I'm pleased to meet you here with your comment - thank you! How fantastic to share all that great information. Thank you so much. I don't use real mistletoe any more in the house because I'm afraid the cats will get into it, but I still love and appreciate it from afar. Hi Devon - good to see you here - thanks for calling in. So pleased you enjoyed the info - the cats probably would love the smells associated with mistletoe - but glad you still appreciate it. 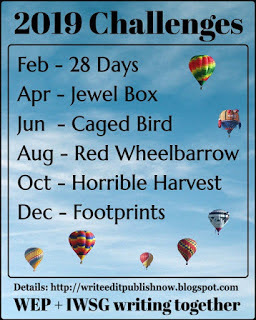 Your scheduling sounds well discliplined and good to know .. and your planning for 2010 - I aspire to that - !! Thank you for your post on this topic. I really appreciate your answering my previous question in this post. Now it is clear to answer my wife and her friends about Mistletoe and Christmas. It is very detail explanation with helpful pictures. No wonder so many people commenting on this post. I am impressed!!! Hi Shaw .. thank you so much - and if I've answered your questions - that is great! I love writing about these various topics - as I learn too .. and if your Chinese wife, herfriends, and you can understand a little of the history of our western traditions that's good too. Thanks for the compliment - appreciate it. Have a wonderful time with Snowy, your wife and friends and family .. and your Christmas lights! Enjoy the time together ..